By plugging this Long Range USB Wi-Fi Adapter to any USB ports of your desktop, laptop PC, or MAC, you can get WiFi speed of 867Mbps on 5GHz WiFi band or 300Mbps on 2.4GHz. You can use the 5GHz Wi-Fi band for lag-free online gaming and HD video streaming, and the 2.4GHz band for online voice call and shopping. Also, it works with ANY wifi routers, including ac/a/b/g/n. 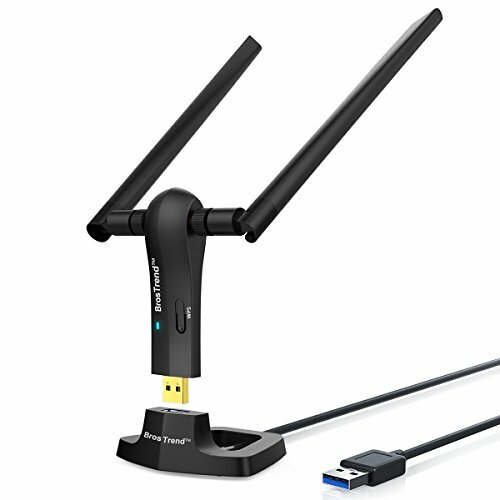 You can get extended range WiFi by using this long range wireless network adapter. BrosTrend wireless USB adapter comes with free USB 3.0 cradle with USB extension cable of 5 feet, wifi antennas are horizontally and vertically adjustable, easy for you to find a spot with best wifi Internet connection. This dual band wifi adapter works with Windows 10, Windows 7, Windows 8, Windows 8.1 / XP/; MAC OS X 10.6~10.10 (MAC 10.11, 10.12 and later NOT Supported); It is the best Windows 7 and Windows 10 usb wifi adapter. WiFi Adapter Itself Size (L X W X H ): 3.78" X 1.18" X 0.83"